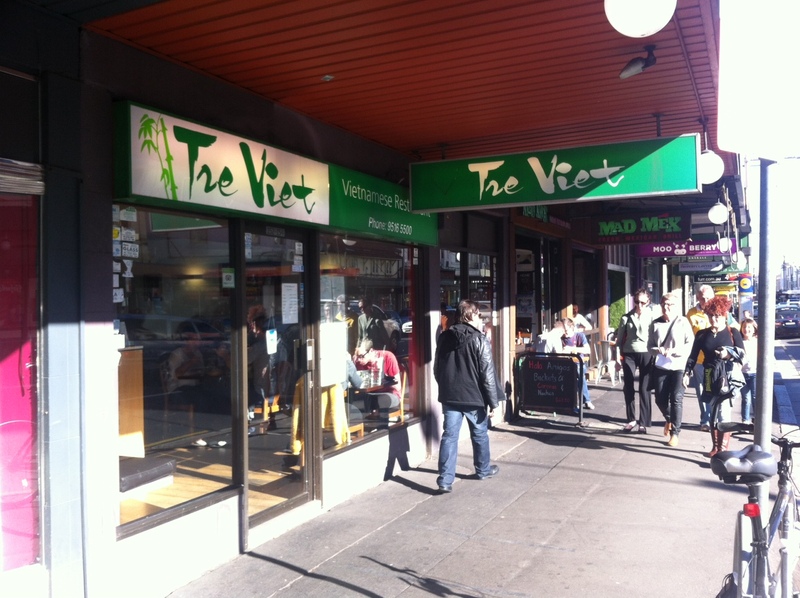 When we got to Tre Viet two things struck me. The empty restaurant was being warmed by the gentle strains of a Viennese waltz and they had an aquarium. These were both firsts for the quest and fitting additions to our first lunchtime outing. We have opted for lunch so that the Melbourne-based members of the family can join us. Specifically so that the Heathen-Outlaw can make it. We have also performed a bit of jiggery-pokery with the running order so as not to inflict New Taste or Mad Mex on the out-of-towners. The family are in town because we have just celebrated the 90th birthday of the G-rent-mother, which was very pleasant. So we have squeezed a questing into the packed program, between a morning’s outing to the Sydney Park playground and a mid-afternoon dash to the airport. Due to a lack of seats in our motor, Stropette and I volunteer to take advantage of the crystal clear day to walk to the restaurant pushing the sleeping Pancetta and her stroller in front of us. This peramble gives us the opportunity to explore the far reaches of King St and to do a bit of quest calculating. As of last Sunday there are 50 eateries on the far side of the station and then another 16 to Church Street which is looming as our target for the end of the year. So I’m thinking that the quest is looking like a 2 year thing. This is do-able. Then we can get our lives back. There has been a bit of chat amongst Strop’s Crew about taking a detour at Enmore Road, because that is where the cool is now, but I think these notions have to be rejected as revisionist nonsense. We must stick to the plan, even if it is a bad plan. While the Stropolina and Pancetta are oohing and ahhing over at the aquarium (it really is a classy aquarium, it’s got coral and stuff, just like Feej) the rest of us get the essential beer order in. Unfortunately in our haste to get a thirst quencher down our gullets, we miss the fact that they stock the trusty Vietnamese 333, so we have to quickly down our James Squires and Tigers so we can move on to the more culturally appropriate 333. The restaurant is beginning to fill with a restrained Sunday-lunch crowd. 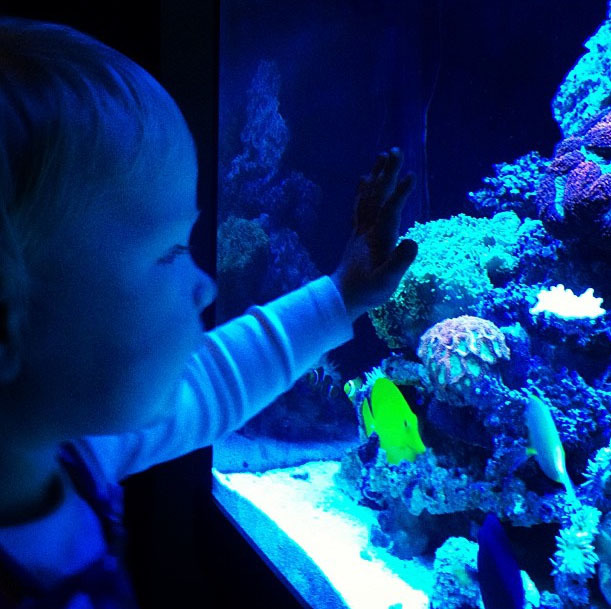 There is a cool and relaxed atmosphere to the restaurant which is exemplified by the aquarium. Our table soon disrupts things though by deciding that we need a bigger table to accommodate the high chair. As the bemused wait-staff look on the female members of the party begin appropriating the adjoining tables and shuffling chairs, strollers and beer glasses. When someone, that might have been your correspondent, points out that we are disturbing the Vibe of the place, Strop looks disdainful and announces that she is “Deaf to the Vibe” which effectively ends the discussion. When we are all re-settled and have identified our own beer glasses, the Heathen Outlaw throws a bit of a spanner in the food ordering works by enquiring about No 37. He obviously hasn’t been paying attention: the No. 37 rule only comes into force in Thai establishments. We are on the wrong side of the border here mate. Not that there is anything wrong with him choosing to order No. 37 if he so desires but it would strictly be on the basis that it was “just another dish, might as well be No. 19”. When the dish in question turns out to be a Chicken Curry with Coconut milk the issue is quickly dropped, and Strop takes over the ordering, while I tap out what are now indecipherably cryptic notes on my phone. We start out with Betel Leaf Beef which turn out to be surprisingly similar to scrumptious little sausages only wrapped in betel leaves and with coriander flavours. They disappear very quickly, but are followed by fresh spring rolls, and a vegetarian pancake. While we are busily stuffing our faces, talk turns to the planning of a Wedding that will turn the Heathen Outlaw into the Heathen in-law. There is heated discussion regarding possible venues, catering, guest lists and gifting arrangements. It soon emerges that there deep philosophical divides regarding the righteousness of the Gift Registry. Some people are more risk averse than others I suppose. Personally I think the risk of receiving 13 toasters and 5 ugly vases is worth taking, but then I come from a generation that thought nothing of getting married in a park in February without even a thought to deploying a risk-management marquee. The rest of the food arrives before the Gift Registry Stand-off turns ugly. There is a Caramelised Pork Hotpot (big ticks), Papaya Salad, Chilli and Lemongrass Beef (yum), Charcoal Grilled Chicken and eventually Poached Vegetables. This sounds like a lot but there wasn’t much left by the time we had finished. We even had room for Vietnamese Coffee, with a yummy hit of condensed milk, and a couple of those strange Asian drinks with the coconut milk, weird green agar worms and red beans. Pancetta thought this was nearly as exciting as the aquarium and indeed parts of the drink wouldn’t have been out of place amongst the coral. Tre Viet is a similar scale and style restaurant to Thanh Binh but has a calmer and less hectic vibe (even allowing for a lunchtime visit the calming effects of the aquarium are obvious) but I think Thanh Binh has a slight edge on the food side. Next up we are back across the road and back into the realm of cocktails at Corridor. See you then.